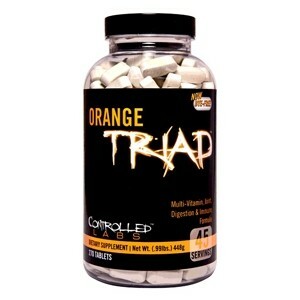 Designed for the serious athlete, Orange Triad delivers! Serious athletes are unique in that they intentionally subject their bodies to incredible amounts of stress with training and cardio. Over time, muscles, tendons, and ligaments take longer to recover which means you can't train them as often as you would like. Nutritional support is key to getting optimal results from your training. Orange Triad combines key vitamins, minerals, and nutrients for supporting optimal digestion, immune system, and bone health into one "twice daily" food supplement. Start by taking 1 tablet to assess your individual tolerance. If you experience any unusual occurence, stop and consult your doctor. Take 3 tablets twice per day with meals. Consume at least 3.78 litres of water per day.